As Joshua is preparing to take Jericho, a man holding a sword appears before him. This man identifies himself as the commander of the Lord’s army. Joshua prostrates himself, while the man tells him to take off his sandals for he is standing on holy ground. The Lord spoke to Joshua and told him how to take Jericho, which had now retreated behind their city walls. The Lord tells Joshua to march around the city one time with all of his men for 6 days. Have 7 priests carry trumpets of rams’ horns in front of the ark. On the 7th day, march around the city 7 times, while the priests blow the trumpets. When the priests give a loud blast on the trumpet, have everyone shout and then the walls will collapse and you can just walk in and take the city. So the people obeyed Joshua’s orders and did exactly as the Lord had commanded. On the 7th day, Joshua commands the people to shout and take the city that the Lord has given them, but to spare Rahab and all who are with her in house. He also warns the people not to take the devoted things or they will be destroyed. All the silver, gold, bronze, and iron (the devoted things) are sacred to the Lord and must go into His treasury. The Israelites devoted the city to the Lord and destroyed everything and everything–every man, woman, child, cattle, sheep and donkeys. Rahab was escorted safely out of the city by the two spies whom she saved and placed into a camp near Israel’s camp. Then the whole city was burned to the ground, excepting the silver, gold, bronze, and iron, which went into the Lord’s treasury. Rahab lived amongst the Israelites all of her days. Joshua cursed the city never to be re-built. The Lord was with Joshua and his fame spread. 3) Joshua met a man with a sword in his hand who identified himself as the commander of the Lord’s army. The man is acting on the Lord’s orders to appear before Joshua. He is following a command and is therefore indifferent to whatever is happening in Joshua’s world. 4a) The Lord encourages Joshua, saying that Jericho is already his. He has delivered it into his hands along with the king and all the fighting men. Thus, Joshua’s faith and courage would be bolstered, and his trust grown deeper roots. God wants us to succeed. He is a loving God who encourages and cares for His people. b) This is one of the most unique “battle” strategies ever. To begin with, there was no battle. The men marched around the city, blew some trumpets, the walls fell down, and Jericho was taken. The Israelites I’m sure were confused and wondering what was the purpose of this. The residents of Jericho must have thought the Israelites were insane and wondered what was wrong with them. 5a) God ordered Joshua to kill every living thing inside the walls of Jericho except Rahab and her family who were congregated inside her home because she had saved the lives of the two spies. God ordered the people killed as judgment upon them for their sins against the Lord–namely unbelief, worshipping other gods, and the so-called religious traditions they practice such as burning their sons and daughters as sacrifices to these false gods. The land was burned because even the land was defiled. b) Personal Question. My answer: This is a perfect example of why so-called “innocent” people are killed and slaughtered. None of us are innocent. We are all guilty of sin and deserve death. When what seems to us senseless killings (floods, earthquakes, tsunamis, or wars against each other) all serves a purpose in God’s plans for us. That’s why bad things happen to “good” people. None of us are good. Who doesn’t love this story? I would have loved to have been there to see such a sight, and I would have wondered what on earth these crazy people were smoking to be marching around a city and blowing trumpets. It’s such a classic tale of complete and utter trust in the Lord. Note no Israelite is killed as far as we know. The city was taken without a fight. That by itself is a miracle. We know that this man, standing before Joshua, was God. Although the man identifies himself as the Commander of the army of the LORD, leading some to say this may have been an angel (Revelation 12:7), angels are never worshipped (Revelation 22:8-9). Furthermore, Joshua calls the angel “My Lord” and removes his sandals like Moses did at the burning bush (Exodus 3:5). Army of the Lord does imply that this was an army of angels. Some Biblical scholars speculate this could have been Jesus in bodily form, which we know he existed from the very beginning, so this could be possible (Genesis 18:16-33, 32:24-30, and Judges 13:1-23). The whole point of this section of Joshua 5 is to show that Joshua is obeying God whole-heartedly and submitting to God’s will and not his own. With the army of the Lord on our side, how can we lose? Why did God appear before Joshua? God appeared to instruct Joshua on the very important taking of Jericho and, as we’ll see, it was such an unlikely scenario that it could have only come from God. God came to make sure Joshua was completely committed to Him–a lesson for our own lives. Are you completely and totally committed to whatever God tells you to do? Before, the Israelites have only had promises from God. Now it’s time to deliver. And God starts with the hardest first. Jericho, a formidable city, might possibly mean “city of the moon god.” It was located 5 miles west of the Jordan River and 7 miles north of the Dead Sea. It’s climate is tropical and in ancient times date palm trees flourished there as well as balsam, from which medicine was extracted. Today, banana groves grow, fed from springs of water, a green oasis in the middle of the dry Jordan rift area. It’s capture was the key to the invasion of the central hill country. In the New Testament, its location shifted south a few miles. It yielded a large revenue to the royal family and Herod the Great’s winter palace was built here. The road from Jordan to Jerusalem passed through Jericho, making it a stopping place for Galilean pilgrims to Jerusalem who traveled this way to avoid contamination by the Samaritans. Jesus passed through Jericho on a number of occasions (Mark 10:46-52; Matthew 20:29-34; Luke 19:1-10; Luke 10:29-37). Archaeology supports a city at Jericho since the seventh to sixth millennia BC, which puts Jericho as one of the oldest cities known–having existed 5000 years before Abraham. 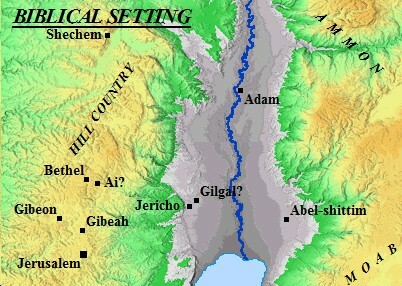 Many archaeological digs have been conducted over the years to determine if Jericho actually existed. 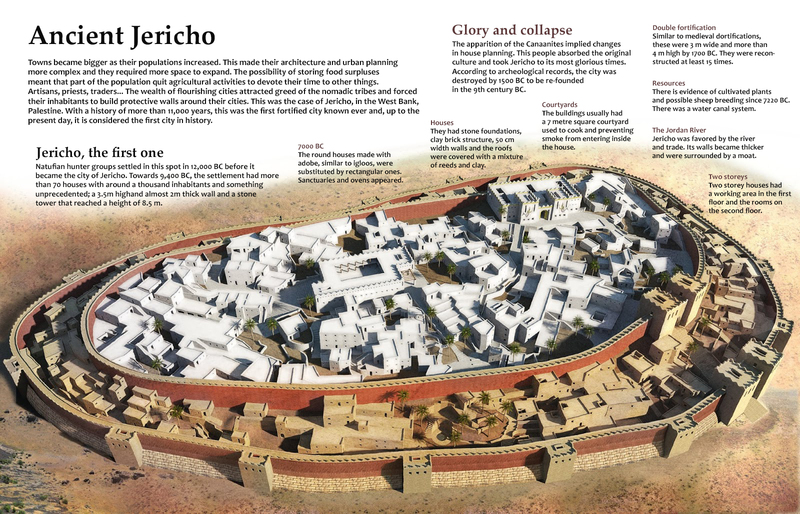 Some scholars believe it did, but Jericho was a much smaller fort. Evidence has been eaten away by the elements. So much digging has been done that the likelihood we’ll ever know remains doubtful. God tests their faith first by having the city fall by the most unconventional of means. It required total faith by Joshua and total faith by all of the Israelites. Again, we see how God’s people have to do something; God just doesn’t give them the city. Normally, the ark of the covenant does not go into battle. This was so the people know God was with them. Joshua acted immediately, without delay. The Israelties were open to attack as they marched around the city. The Israelites had to be patient and persistent as they had to march for 6 days, doing something that required absolute faith. All the valuables are set aside for God as Jericho is the first fruits. Everyone (except Rahab and her family) in Jericho is destroyed because they are in total rebellion against God. Israel took what God gave: the city. When the wall fell, were the Israelites surprised? I’m sure the people of Jericho were shocked. How often are we surprised when God fulfills His promises? Slaughtering everyone is a harsh penalty. But the Canaanites were in spiritual disobedience and this was their judgment. God chose His people to enact the penalty. Sometimes, He does the consequences like in Sodom and Gomorrah (Genesis 19:24-25). We know that Jericho had heard about the God of Israel (Joshua 2:8-11), but only Rahab responded. Thus, she is rewarded with her life. Scholars say Joshua was written at the time these events occurred because of the line “she [Rahab] lives among the Israelites to this day. Joshua’s curse in Joshua 6:26 was fulfilled literally when a man attempted to rebuild the city of Jericho in the days of King Ahab (1 Kings 16:34). Obedience: Joshua and Israel follow God’s commands. Courage: Joshua and Israel execute God’s commands. All while trumpets are the weapons, not swords. Like we saw with the 10 plagues of Egypt, God is declaring war on all of Canaan who are wicked (Deuteronomy 9:5) and had forfeited their right to the land 400 years prior (Genesis 15:16). For some reason I can only get the questions and not the notes. The post that Atoz submitted was so perfect and thorough. Thank you Atoz. I can only get the questions too. Would love to read the notes, but I get so much out of your posts Atozmom!! Thank you! !